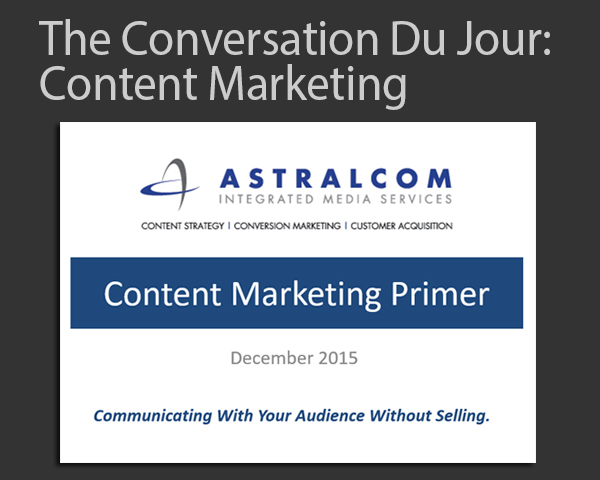 Content Marketing Primer – Presentation | ASTRALCOM - Content Strategy, Conversion Marketing and Customer Acquisition. Content Marketing Primer – Presentation | ASTRALCOM – Content Strategy, Conversion Marketing and Customer Acquisition. Our clients are asking and you probably are, too: What exactly is content marketing? The Primer is a FREE, quick overview with some solid info that will help you understand the value of content marketing. Have a look and then let us know how you put The Content Marketing Primer to use.